ASIFA-Atlanta and Atlanta Film Festival 365 are joining forces for the decade celebration of Roll Yer Own, an independent animation festival featuring locally produced animated shorts. This year the program includes ASIFA-Atlanta’s favorites from the 2012 Atlanta Film Festival! The screening will be held at the historic Plaza Theatre, followed by an afterparty at the just-as-historic Manuel’s Tavern. Expect an inspiring range of experimental, traditional, stop-motion and 3D animation from creators near you. Recommended for ages 14 and up, tickets are $6 for general admission and free for ASIFA members. Admission includes a limited print ASIFA-Atlanta Yearbook, highlighting local cartoon artists! 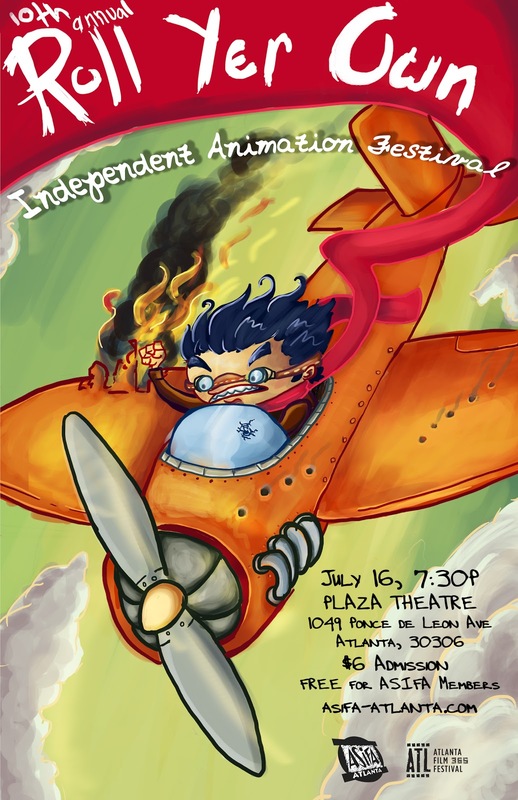 Thanks to community support and a dedicated volunteer staff, ASIFA-Atlanta provides opportunities for local animators to screen their work and forums to share ideas . "ASIFA" represents the Association Internationale du Film d'Animation and was founded in France in 1960 as a membership organization devoted to encouraging animation. We strive to provide opportunities for local animators to present their work.